Stems: Erect, much branched, conspicuously rough-hairy, especially above; branches ascending. Leaves: Mostly alternate, lowermost sometimes opposite, sessile, simple, numerous, lanceolate to lance-linear, .4 to 2.8 inches long, 1/8 to 2/5 inch wide, usually with prominent pair of teeth on each side near base, occasionally un-lobed; surfaces green, rough-hairy, upper surface only sparsely hairy; tip tapering to point; base rounded to heart-shaped. Lowermost leaves are often gone by flowering. Inflorescences: Monoecious; staminate heads above pistillate heads in dense spikes; pistillate heads single or few clustered in axils of leaves subtending staminate spikes. Flowers: Greenish, inconspicuous, ray florets absent; staminate heads sessile; involucre slanting cup-shaped, 1/10 to 1/6 inch in diameter, 3- to 5-lobed; pistillate involucre bur-like, enclosing 1 floret, with spines in 1 to several rows. Fruits: Achene, nut-like, oblong, 1/5 to 1/3 inch long, 4-angled in cross-section, with stout beak and 4 longitudinal ridges terminating in short spines. Habitat: Open disturbed areas, pastures, roadsides, upland prairies, stream banks, woodland openings. Forage Value: Seeds are eaten by turkeys. Comments: bidentata alludes to the leaves having two teeth or lobes below the middle. 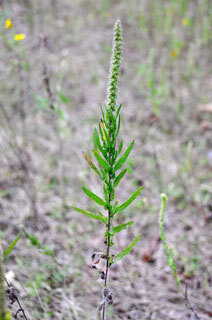 The pollen of southern ragweed may cause allergy symptoms.